You can't clear thousands of dungeons without making a few Frenemies... so that's what we did! 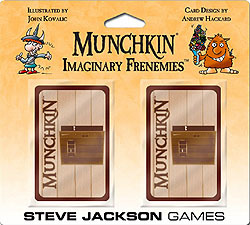 As long as your Imaginary Frenemies are safely stored inside their blister, they help you in combat... but if you release them to get at the cards inside, you can't use their rule any more. Oh, temptation! With Frenemies Like These, Who Needs... Uh, Rules? As long as this package remains unopened you may keep your Imaginary Frenemiesin front of you as a +2 combat bonus. It cannot be lost to Curses, Bad Stuff, or theft, and stays with you even if you die. Sign the two Door cards inside (Yes! With a REAL pen! In permanent ink!) and put them in your hand as well. When you play a card that you have signed, it has double effect. Save this so you remember this rule in the future!